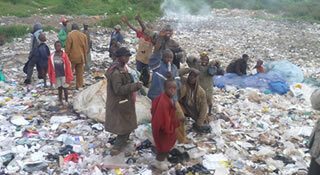 We first encountered Danson living on the rubbish dump in Eldoret. He was addicted to glue and had little hope of a future. With no family to care for him, he begged and sifted through rubbish to try and make a living. After taking his photograph with other street children, Rose Lancaster felt particularly drawn by the sadness in his eyes. 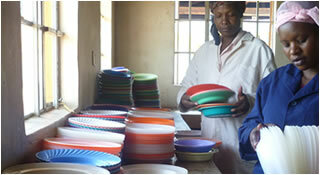 His image alone compelled her to pursue practical ways of doing more for the street children of Eldoret. Rose felt a personal responsibility to Danson and asked friends already living in Eldoret to seek him out and then financed getting him off the street. 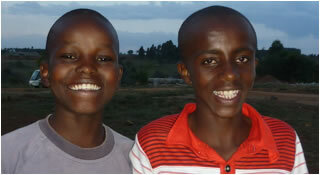 Two years on, Danson is safe and well, living with other orphans in a purpose built village. He no longer sniffs glue and is doing incredibly well at school. Sadly we cannot take all the children off the streets in this manner, but we have used Danson’s inspirational story as a catalyst to develop a much more far reaching project that will have the ability to affect the day to day lives of thousands. He was orphaned at 3 years old and went to live with a distant aunt. She abandoned him when he was 13. "I used to sleep in the verandahs of tall buildings in town or in sacks in the street. At night the police came and chased us away. We had to run to the outskirts of the town but that was where the local thugs hung out. It was very frightening but I became hardened to it. The worst time was when it was raining. We couldn't sleep and didn't have food for days. When I found food, others fought me for it. I mainly ate left-overs in dustbins. Without The Solomon Project I would not be at school. Without school I do not know what sort of life I would have. Now I have plenty of food and I have put a lot of effort in to learn. I have a vision to help others in the way this school has helped me." Being in school has taught 'Peter' self discipline and put order in his life to the point that he is now staying at a residential unit which supports him in his schooling. 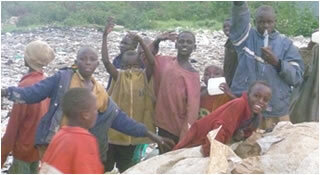 Street children who are offered a shelter in these types of units struggle to stay as they cannot adapt to routine. 'Peter' told us he brought 9 friends to the house with him, but 4 ran away. Of the those that stayed, all are now thriving in school. How amazing that being able to offer free school meals can change lives so dramatically! 15 year old 'John' lived on the streets for 5 years from the age of 7. He had to leave home when his father died and his mother became sick through HIV. "My worst experience was when I ate rotten meat from a bin. I think it was a rat which had been poisoned. I had to sleep in the street with no covers and I used sacks as clothes." He now lives with a friend who is 3years older than him. He did go to school in 2008 before the feeding programme began, but his friend struggled to make enough money to feed them both so he used to take 'John' out of school to help make money. "When the feeding programme came here I was really excited because I used to be so hungry I used to fall asleep in class. now I feel happy, good and energetic. I have hope for the future. Engineering is what I want to do." His family were often hungry and he heard that there was plenty to eat on the streets so he went to join the street children in Eldoret. on the first day, the boys had money so they bought food and shared. The next day they abandoned him. To survive he had to steal from scrap dealers but they caught him and handed him over to the authorities. The police put him in a dark cell and whipped him. In between his bouts on the street he went to school. He first went to school aged 6 then left and returned at the age of 8. He came to the school last year because of the food. " I feel lots better now." 'Mark' now has a sponsor who supports him in a number of ways.